Pointe Marin is a newer housing development in highly desirable Southern Novato, Marin County (which is about 17 miles north of the Golden Gate Bridge). It is favored by families and retireess alike and is undoubtedly one of Novato’s most sought-after neighborhoods. 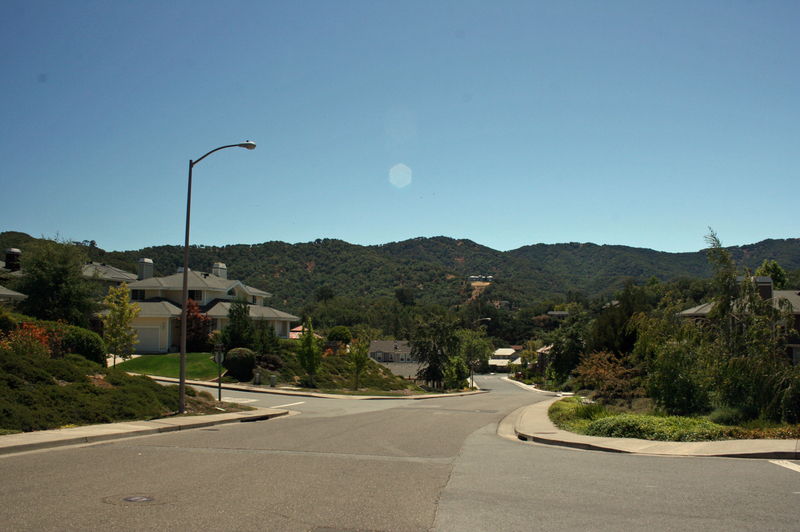 This Novato neighborhood was built in 2004 to 2006. It is quiet and relaxed, with wide streets and lots of cul-de-sacs and parks. Many of Pointe Marin’s homes back up to open space and all are within close proximity to shopping, transportation, HWY 101, hiking trails, pools, sports field, parks, and schools. Breakers (a luxury targeted, sub-neighborhood within Pointe Marin) is a 106-house development by Shea Homes, built on ground once occupied by officers’ housing at the now-defunct Hamilton Air Force Base. What better place for Marin County’s latest crop of $1 million-plus homes? Just across the street from the main gate of the old base, Breakers has the framework of a more mature residential neighborhood already in place. There are tall sycamore trees and wide sidewalks. The development, the fourth and last neighborhood in Novato’s Pointe Marin planned community, also has four city parks and three tot lots. Pointe Marin has 1,109 homes on 107 acres. Of the six floor plans offered at the Breakers, five are two-story designs ranging from 3,447 to 4,413 square feet. The smallest and sole single- story floor plan is the Custom House, a still spacious 3,205 square feet. Profile of The Montecito — 3,849 square feet that includes 4 bedrooms and 4 1/2 baths. The house is entered through an arched doorway opening to a marble- floored, two-story foyer with a staircase to one side. Just off the foyer is a small hallway with a powder room and an entrance to a bedroom with a full bath. Beyond this suite is the study. The living room with an optional fireplace is straight ahead. To the right of the foyer is a hallway leading to the dining room that opens out to a trellised courtyard perfect for al fresco dining. The combination kitchen and family room is to the left. The family room hides a media niche and boasts a fireplace along one wall. The L-shaped kitchen wraps around an island with a double sink and dishwasher behind a broad service or snack counter. The countertops are granite, the appliances are stainless steel and the range is a Wolf. There is a nook and access to the laundry room adjacent to the kitchen. The laundry room comes with sink, plenty of counter space and lots of built-in storage. A pantry closet with access to the three-car garage and the butler’s pantry lies just off the kitchen. At the top of the stairs are a bonus room and a long hallway with a linen closet, a bedroom with a deck and a walk-in closet, and a third bedroom with a full bathroom. The master bedroom suite takes up almost half of the upper floor and has his-and-hers walk-in closets, dual sinks flanking an oval, Jacuzzi-jetted tub and separate rooms for the WC, shower and sitting area. A fireplace and a door to ensure privacy in the master bath are optional. Pointe Marin Neighborhood Amenities — Pointe Marin is also close to the prestigious Marin Country Club, Stonetree Golf Course, the Indian Valley Campus of Marin Community College, and several other sporting and recreation highlights. In addition, the recent renovation of Pacheco Plaza (Paradise Foods, Boca Pizzeria and Wine Bar, and more) and the completion of the Hamilton Marketplace with an upscale Safeway, Peets, Jamba Juice, Starbucks, restaurants, a gas station, banking, and more, brings lots of vitality and convenience. Costco, Target, , Trader Joes, Whole Foods, Boca, and downtown Novato are all just minutes away. Commute times to San Francisco vary, but generally it takes about 35 to 45 minutes during peak traffic hours. Many Pointe Marin residents also work at Hamilton Landing or in the Bel Marin Keys business park. In addition, Southern Marin residents have embraced Pointe Marin as an excellent lifestyle option when it comes time to sell their larger and more expensive Southern Marin homes and downsize (thereby allowing them to transfer their tax base under Prop. 60). My name is Kyle Frazier and I am a Pointe Marin specialist and have sold many homes here since it was built. In fact, I live in Pointe Marin and know of no other agent who is more active in the neighborhood. I am a broker and Certified Residential Specialist (CRS) with Pacific Union International Real Estate, the most respected real estate firm in Marin County. Please call me at (415) 350-9440 if you would like to discuss Pointe Marin or Novato, in general. It is always my pleasure to be of service.